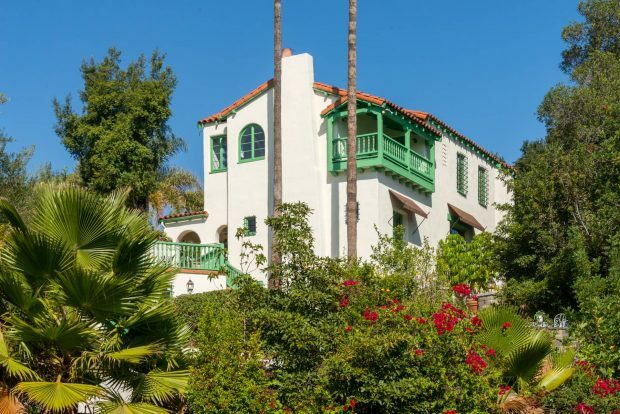 This one-of-a-kind classic, private, and spectacular Andalusian Estate was built by preeminent architect Harry Hayden Whiteley in 1926. 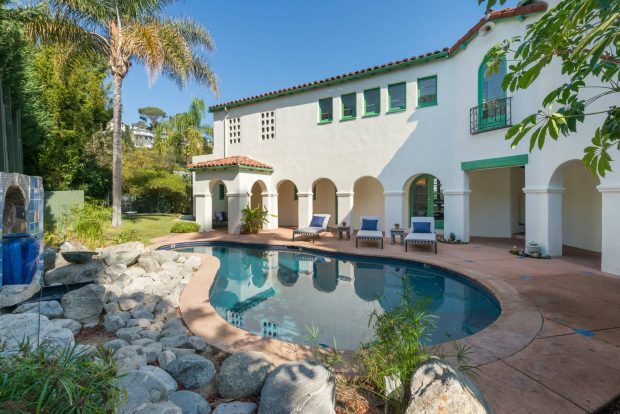 The captivating four bedroom home boasts multiple French doors that open to over half an acre of wonderful outdoor areas including courtyards, pool, patios, grassy areas and gardens. 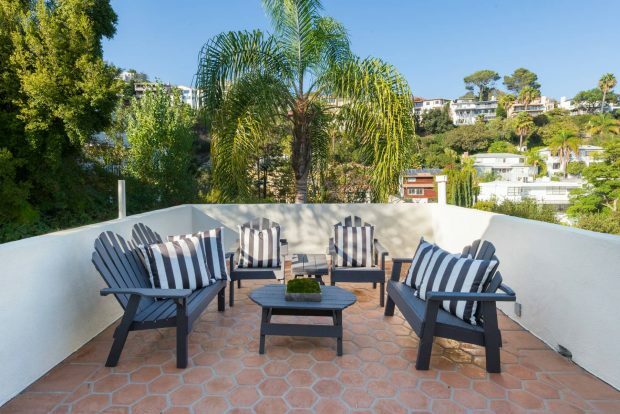 At once an entertainer’s paradise and an exclusive retreat, 4039 Cromwell Avenue offers elegant and refined hillside living in an excellent Los Feliz location. or available for lease: $17,500/mo. 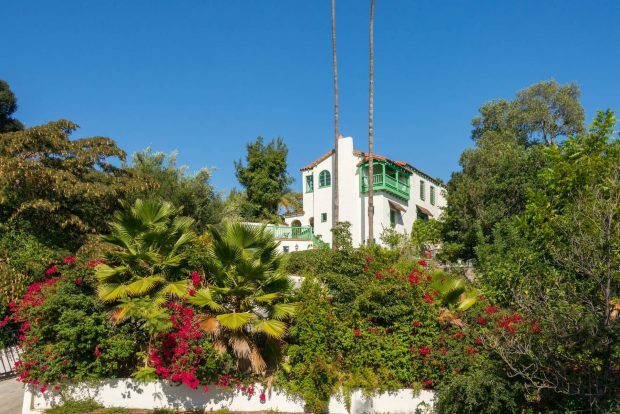 Just as the Hollywood-California design would have been perched on a hill, 4039 Cromwell sits on its own promontory on a large lot in the Los Feliz hills. 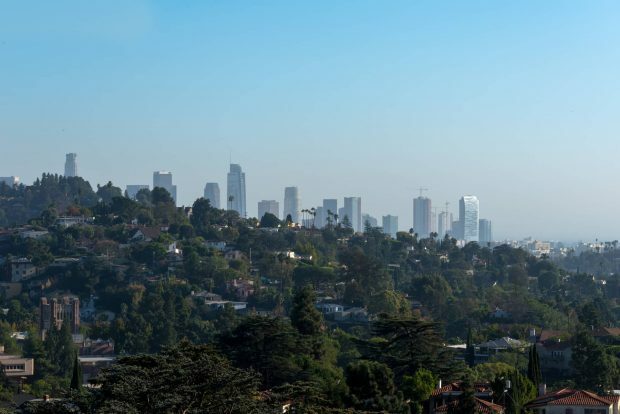 In fact, the home, pool, and grounds take up over half an acre and boast sweeping panoramic views of the hillside and city lights. On a clear day you can see the ocean. 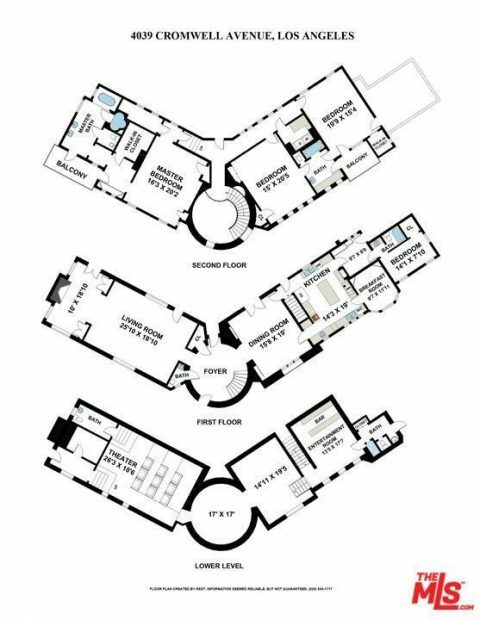 With its climbing and curving celebrity-style driveway, 4 garages plus parking for a multitude of cars, 4039 Cromwell is an entertainer’s dream. 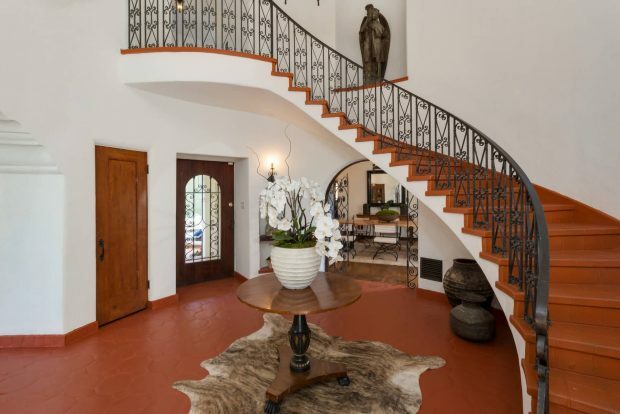 The magnificent formal rotundra entry has a curved wrought iron staircase, an H.H. Whiteley signature. And a gorgeous hand stenciled ceiling. 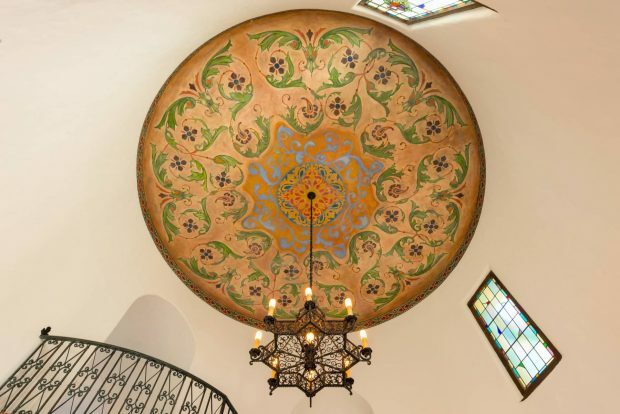 The rotunda, staircase, and stained glass windows immediately sets the tone for gracious living, unparalleled period character, warmth, and ambiance. 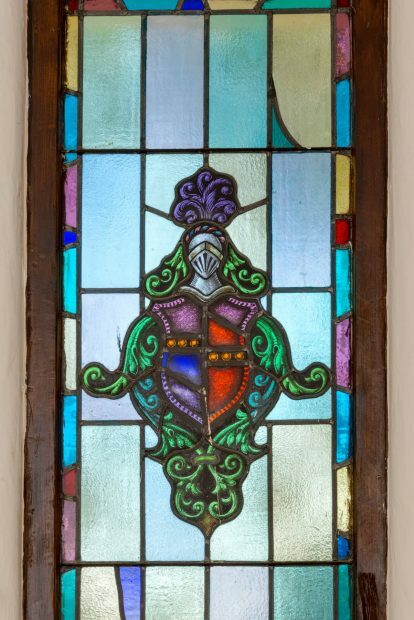 Captivating details are found throughout the home. 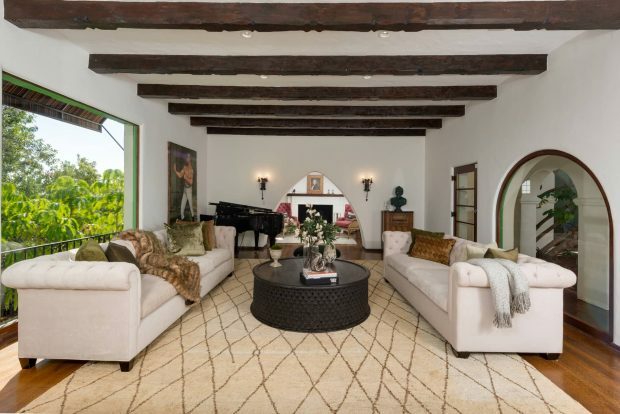 The grand living room boasts lovely wood beamed ceilings, hardwood floors, a fireplace, and Andalusian windows and archways. 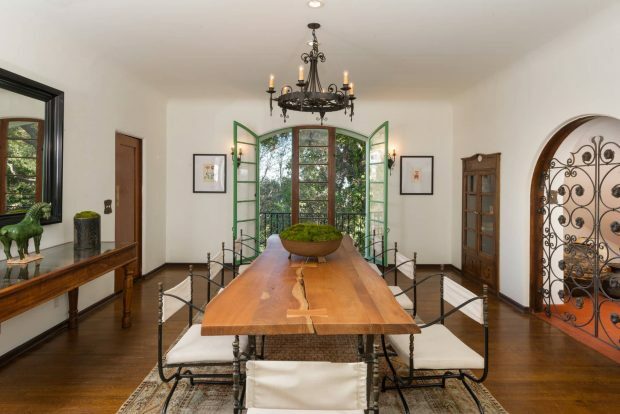 The formal dining room has arched entries and easy outdoor access through a pair of beautiful French doors, making the property primed for special indoor/outdoor events and parties. The Epicurean chef’s kitchen features a center island, green tile backsplash, La Cornue Range, oven, and rotisserie, Duel Viking convection ovens, and a Sub Zero refrigerator. 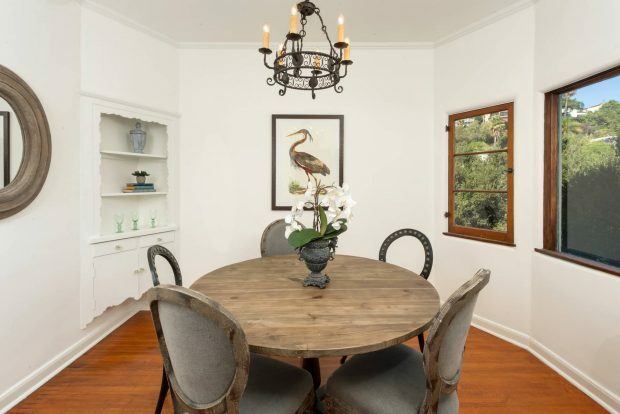 A bright breakfast room boasts excellent views of the Los Feliz hillside. Welcome to the first of four bedrooms, the master suite. 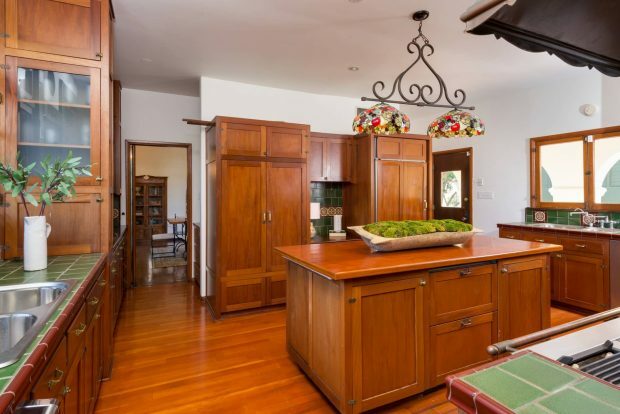 The sizable space has excellent views and gorgeous hardwood floors. 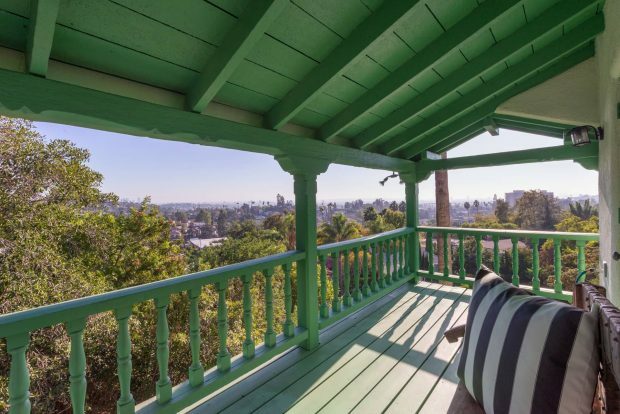 The master’s own private balcony has far-reaching views of Los Angeles. 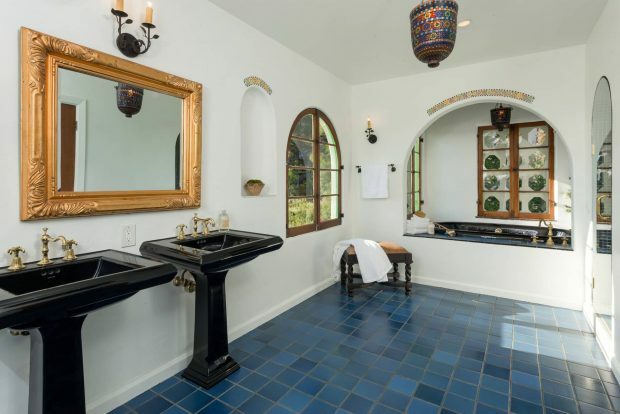 The gorgeous Spanish-style master bath has duel pedestal sinks and both a luxurious tub and a walk-in shower. 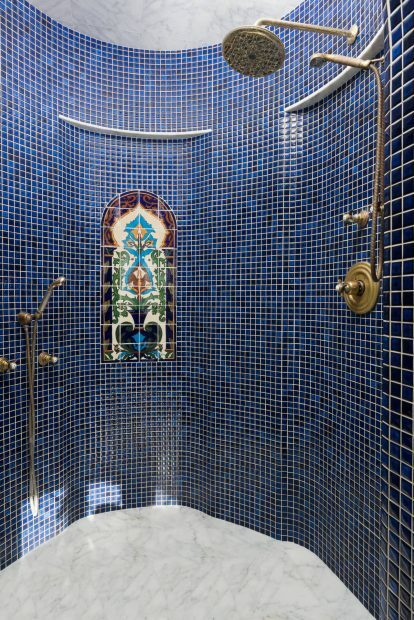 And the shower is simply marvelous. There are two more bedrooms upstairs. 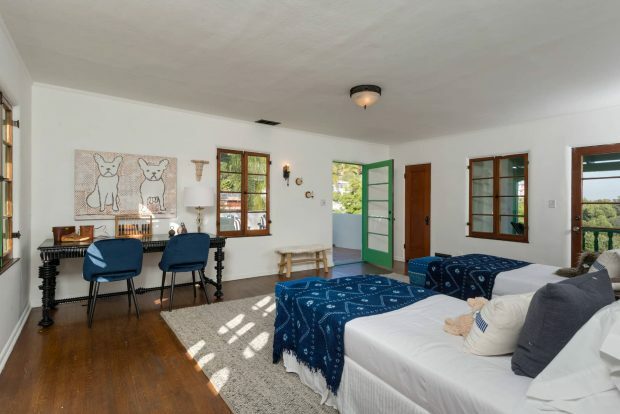 Plus a separate entrance fourth bedroom that is ideal for a nanny, assistant, guests, or as an office space. 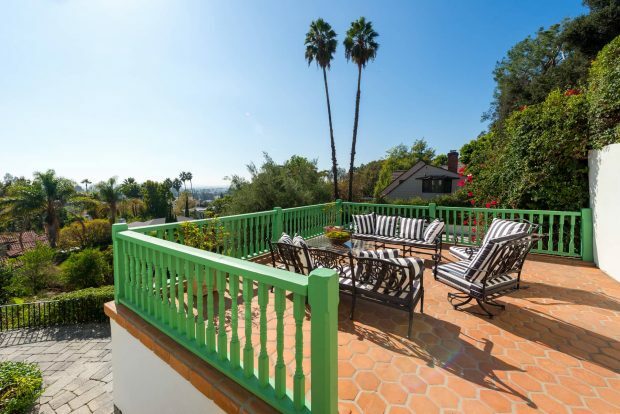 The home’s many balconies are excellent spaces to casually entertain or simply to enjoy the serene views. The lower level of the home is a true show-stopper and a great space for entertaining. 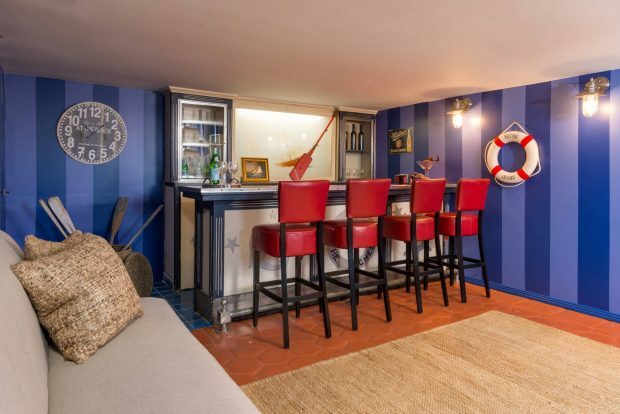 There’s a fun nautical themed prohibition era bar. The bar is the original bar from the “Seven Seas” film set. 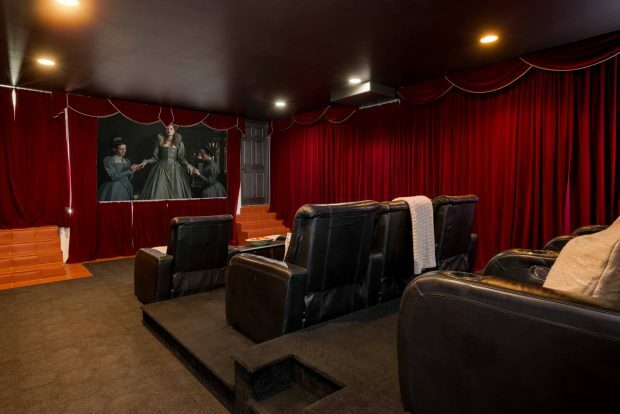 And for film fans and industry professionals, there’s a wonderful screening room that makes you truly feel like you’re at the cinema yet in the comfort of your own home. 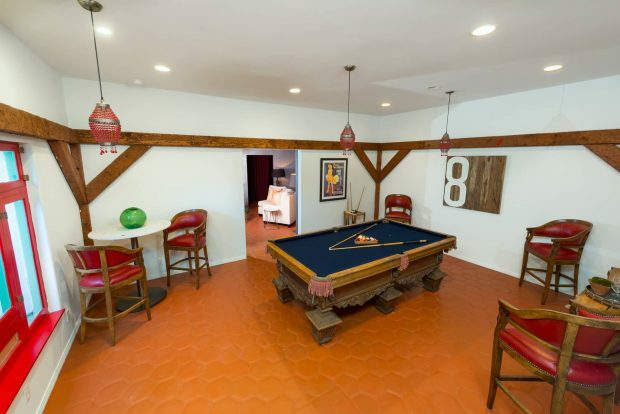 And what prohibition era space would be complete with a billiards room? 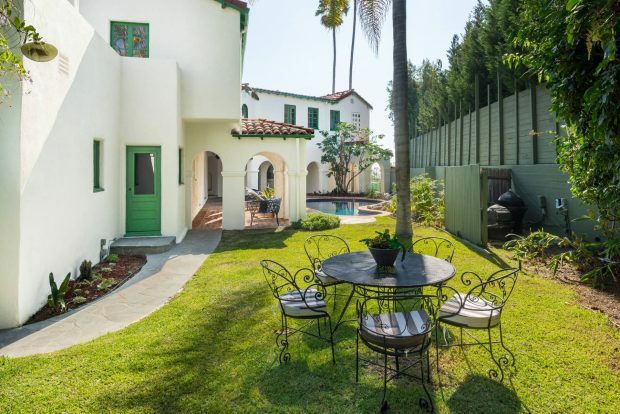 Outside there are multiple areas primed for relaxation and entertaining. The estate boasts plenty of places to explore over its half an acre. But the centerpiece of your outdoor adventures year round will be at this glorious resort-style pool. 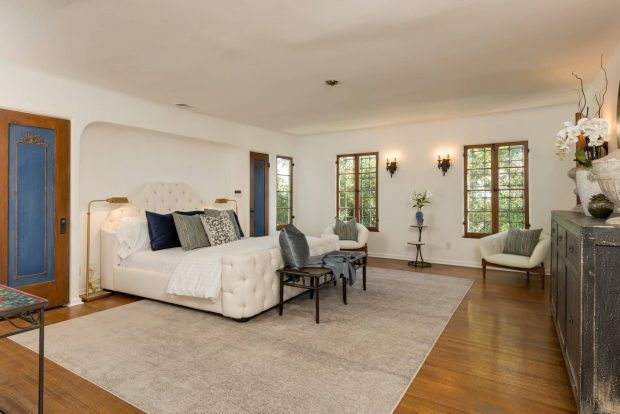 Close to all the best of Los Feliz, plus sited just below Griffith Park and above Los Feliz Boulevard, 4039 Cromwell Avenue is a magnificent and timeless estate. 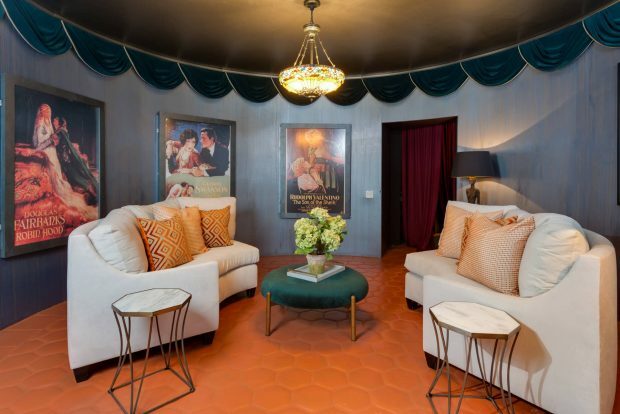 In the 1930s, the home was owned by Jan and Adele Rubini. Adele Crane was an actress and singer. Her husband Jan Rubini was a musical prodigy, playing the violin from early childhood. Jan and Adele met in Australia appearing alongside each other in a musical revue. Jan would later go on to become a well known composer, violinist, and actor and frequently sold out shows in Los Angeles. Some of his credits include Clancy Street Boys (1943), Bal Tabarin (1952) and Jan Rubini and Orchestra (1937). In the late 1930s Jan began an affair with the actress Terry Walker. Terry was an actress, known for Blonde Trouble (1937), Billy the Kid in Texas (1940) and On the Great White Trail (1938). Their affair made the papers in New York leading Adele Rubini to sue her husband for “alienation of affection.” According to Hollywood lore, Adele used 4039 Cromwell as leverage in their planned divorce. If Adele was able to keep the home, Jan would enter financial ruin. This caused Jan to break it off with Terry and commit to at least two years of faithful marriage. But Jan’s love for Terry proved too great and they were finally married in 1940. Jan and Terry moved to New York on Adele’s request, and Adele kept the house. Terry gave up movies to raise a family with Jan. The couple had two children, two sons: Michel Rubini, born on December 3, 1942, and David Alan Rubini, born on December 15, 1945. Both children were musically inclined: David ended up a prodigy at the piano, and Michel played the violin at only 4 years old. Adele later sold the home in the 1940s. 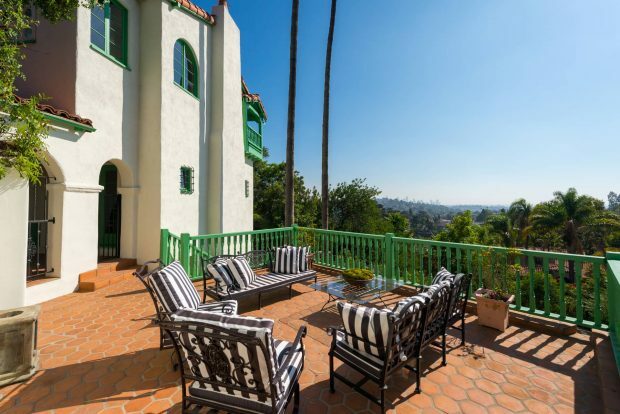 After Adele Crane sold the home in the 1940s it was purchased byVivian Della Chiesa, an American lyric soprano who achieved a high level of popularity in the United States singing on the radio during the 1940s and the early 1950s. Her friend and colleague Judy Garland once mentioned Vivian Della Chiesa by name in her Carnegie Hall concert of January 23, 1961, preserved in the Judy at Carnegie Hall album. The theme of music continued in the 2000s when the home was purchased by former child actor Danny Bonaduce and his wife Gretchen Bonaduce. Danny is best known as the wisecracking, redheaded middle son of the singing pop band in the 1970s television classic The Partridge Family. Danny was the fictional pop group’s bass guitar player. On November 4, 1990, Bonaduce met Gretchen on a blind date and, on a whim, they married that same day. Despite the unusual start to the marriage, the two remained married for over sixteen years and had two children together, Isabella and Dante. Gretchen and Danny amicably parted ways in 2007 and in a twist that echoes all the way back to the 1930s when Adele and Jan Rubini called it quits, Gretchen kept the house. For more photos, go here. 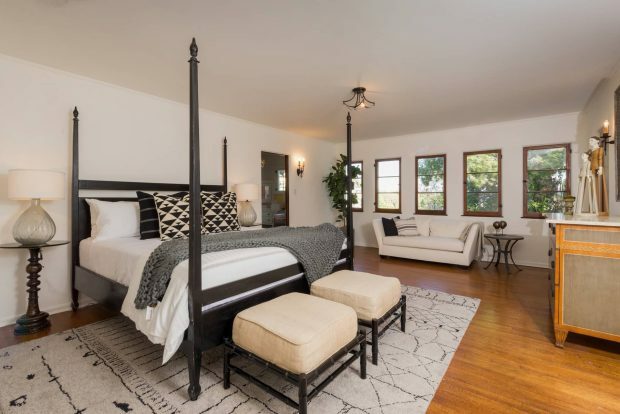 If you would like to view 4039 Cromwell Avenue, call me at (323) 697-3040 or email me at jacqueline.tager@sothebyshomes.com.